Everyone trips and falls at some point. It happens. Some are minor scratches, however, once the shock and embarrassment of falling down is over many victims of these types of accidents often find their injuries are serious and require medical attention. From small bruises and bumps to severe brain trauma and spinal cord injuries, the Centers for Disease Control and Prevention ranks falls as the leading cause of accidental death and injury among seniors. 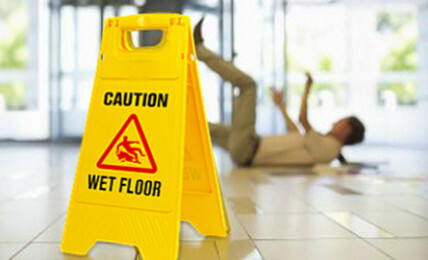 A slip and fall accident can happen on any kind of property — private, commercial, or government-owned. If you were injured in a slip and fall, make sure to document the evidence. Take photographs of the site of the incident and the surrounding area. Collect medical files related to the accident. If there are witnesses, get their information as well. If you are using our Accident APP, you can enter this information into the APP so it is easily available for your slip and fall attorney at Yochelson & Associates. If your injuries were caused by some else’s negligence, you might have a case to sue for compensation for the pain you suffered. You may be able to recover medical costs, lost wages and physical therapy costs that were incurred. The Accident App is an easy to use, step by step guide to help you through a Car Accident, Slip & Fall, or Dog Bite. The Accident App provides user friendly tools to collect the basic data needed for your specific accident. Take pictures using the App, or load pictures taken earlier outside of the App. Enter only the necessary information, and get through the process quickly! Every slip and fall accident has a unique set of circumstances which will determine what actions you can take following the incident. Slip and fall accidents can occur in almost any location and there are numerous hazards that could cause a slip or trip, and fall. Slip, trip and fall accidents can change your life forever, leaving you overwhelmed medical bills, missed time at work, physical pain, and other frustrations. If you or someone you know has been injured due to a slip-and-fall accident, you may be entitled to financial compensation for your damages. The time allowed to file a claim is limited, so contact Yochelson & Associates for a free consultation.